KalFos is produced by SecAnim Ltd in Widnes with Rootwise Ltd being an approved distributor throughout the UK. KalFos has been assessed for safe use as a fertilising agent and soil improver without EA or Animal Health restrictions, as well as no requirement for EA land spreading permits and deployments. KalFos can be used on land covered by various farm assurance schemes, including the Red Tractor Scheme. KalFos is produced by rendering and incinerating Animal By-Products under an approval from DEFRA and a permit from the EA. In addition to making a valuable fertiliser, the manufacture of KalFos also produces enough renewable electricity to power up to 4,000 homes a year. 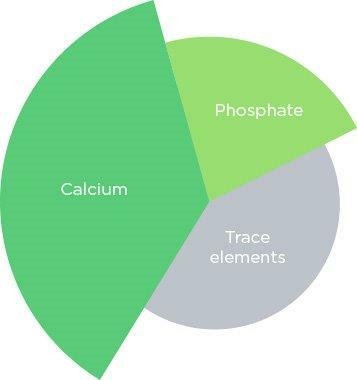 KalFos contains high amounts of Phosphate (22% P₂O₅) and Calcium (37% CaO) along with trace elements that help to improve soil fertility and plant nutrient levels making it an effective replacement to expensive, manufactured fertilisers for use in arable or grassland systems. KalFos is a coarse powder that can be spread at up to 12 metres by a belt fed spreader. As it is not subject to any regulatory closed periods or restrictions, KalFos is available for year-round application.